Maroje Brčić was born in Dubrovnik where he started playing the guitar at the age of 7 under the guidance of his father Stefanin Brčić. Maroje finished high school in the class of prof. István Römer and graduated classical guitar at the Music Academy in the class of prof Darko Petrinjak. 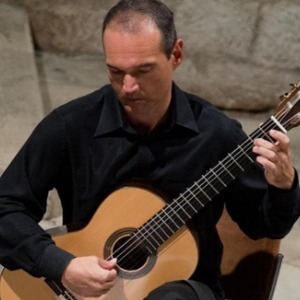 He teaches guitar at the Art Academy of the Split University and regularly gives masterclasses and lectures as well as participates in juries at Croatian music competitions. He also performed with the Dubrovnik Symphony Orchestra, Croatian Television Symphony Orchestra, Chamber Orchestra of Mostar, Zagreb and Sarajevo Philharmonic Orchestra , the Macedonian National Opera and with Moscow Gnesin Virtuosi. Brčić encouraged composers to write music for the guitar and beautiful works for one or more guitars, guitar with a flute, three guitars and a voice were written by distinguished Croatian composers: Željko Brkanović, Nikša Njirić, Ivo Josipović, Berislav Šipuš, Philip Bracanin, Anđelko Klobučar and Zoran Juranić He received a prize from the President of University in Zagreb, ”Milka Trnina“ diploma with Dubrovnik Guitar Trio and together with Zoran Dukić was awarded with a distinguished Orlando Prize for the best music performance at the Dubrovnik Summer Festival.